Appropriate desk height should be about 2 inches above slightly flexed elbows when the child is sitting upright. If the child is slumping forward, the desk might be too low; if the child is leaning back with his/her elbows raised up, the desk might be too high. The child should be encouraged to sit up tall, place both arms on the table, feet flat on the floor, with hips touching the back of the desk. Correct posture can help child focus on learning! 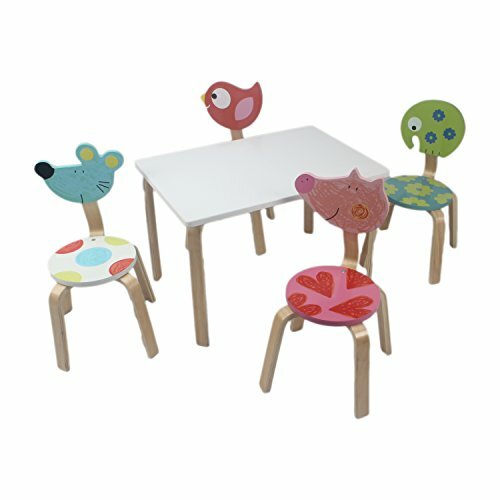 Carefully Packaged Unique Suitable for Kids Bedroom and Playroom to develop Imagination and Creativity with Whimsical Pieces Easy Assembly; Best Gift for Kids Birthday; Christmas Gift & many happy moments Table/Chair legs made by real wood, Tested for stability. Perfect for coloring, arts and crafts, snack time and creative play time to spark children's imagination. If you have any questions about this product by Keewoo, contact us by completing and submitting the form below. If you are looking for a specif part number, please include it with your message.